The Long and Short of it All: A Dachshund Dog News Magazine: Wirehair Wednesday: RAT Edition! It's Wednesday, May 1, 2013, and you're tuned in to www.dachshundlove.blogspot.com and that can mean only one thing: It's Wirehair Wednesday! And boy do we have a good one for you this week: it's the RAT EDITION! There was a similar story and video last fall, Dachshunds On Rat Patrol in NYC, but this time it's been picked up by the Associated Press. Good Dogs! NEW YORK—Bodies tensed and noses twitching, the dogs sniff the hunting ground before them: a lower Manhattan alley, grimy, dim and perfect for rats. With a terse command — “Now!” — the chase is on. 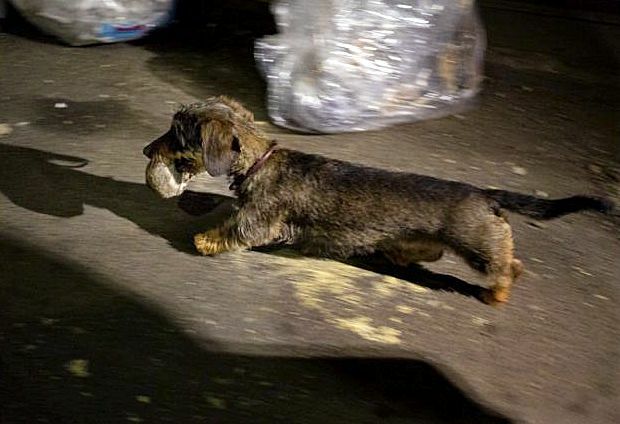 Circling, bounding over and pawing at a mound of garbage bags, the dogs quickly have rodents on the run. “Come on ... I mean, ‘tally ho!’ says one of their owners, Susan Friedenberg. In a whirl of barks, pants and wagging tails, dogs tunnel among the bags and bolt down the alley as their quarry tries to scurry away. On a couple of recent nights, an eclectic group of ratters converged on an alley near City Hall about an hour after sunset. The lineups included two border terriers; a wire-haired dachshund; a Jack Russell terrier/Australian cattle dog mix; a Patterdale terrier, an intense, no-nonsense breed that’s uncommon in this country; and a feist, a type of dog developed in the American South to tree squirrels. Read more at The Star.